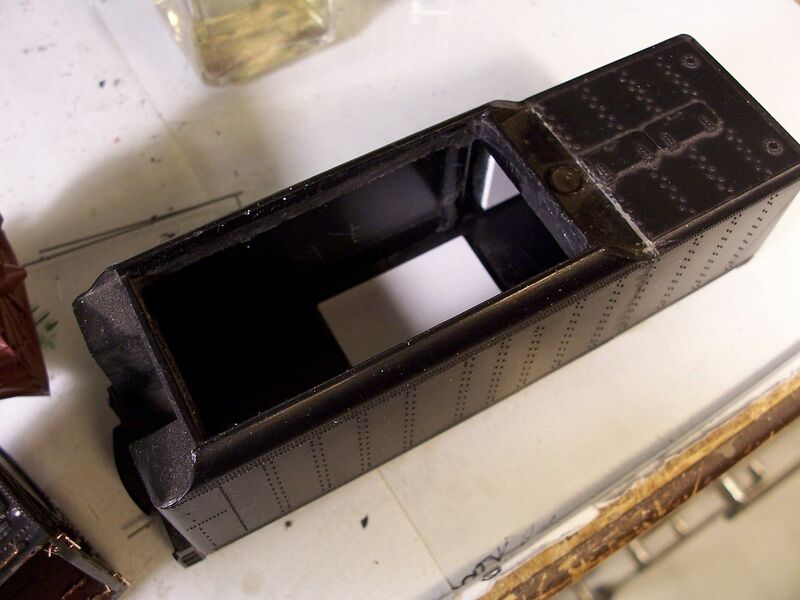 Since I have a few stalled projects on my workbench, a few more on the layout, and a whole pile of them in temporary storage, I thought that it might be a good idea to start another one. 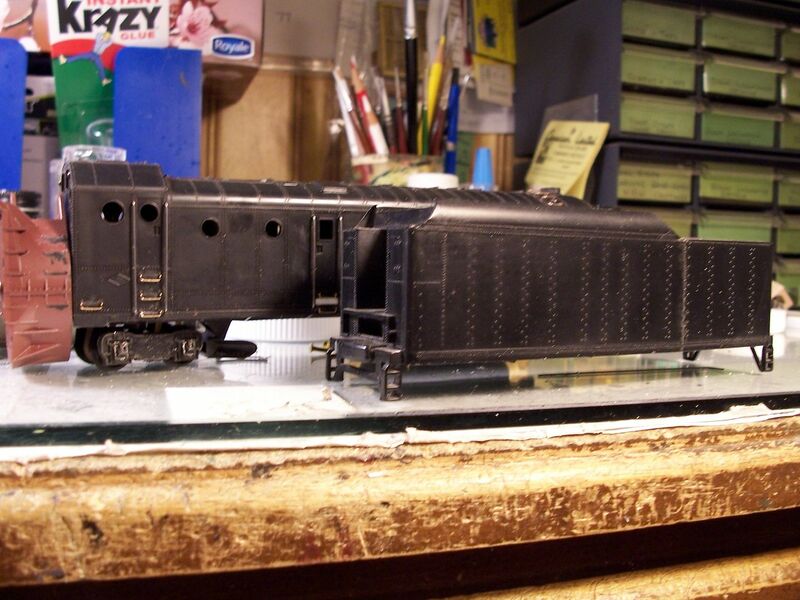 Some time ago, can't recall if it was at the now-defunct LHS or perhaps a train show, I picked up an Athearn kit for their rotary snowplow. 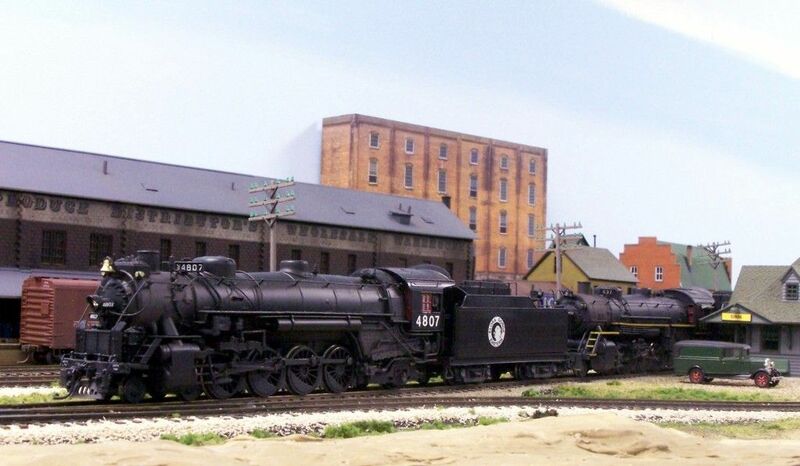 Lettered for Great Northern, it was painted boxcar red, and looked pretty bland. 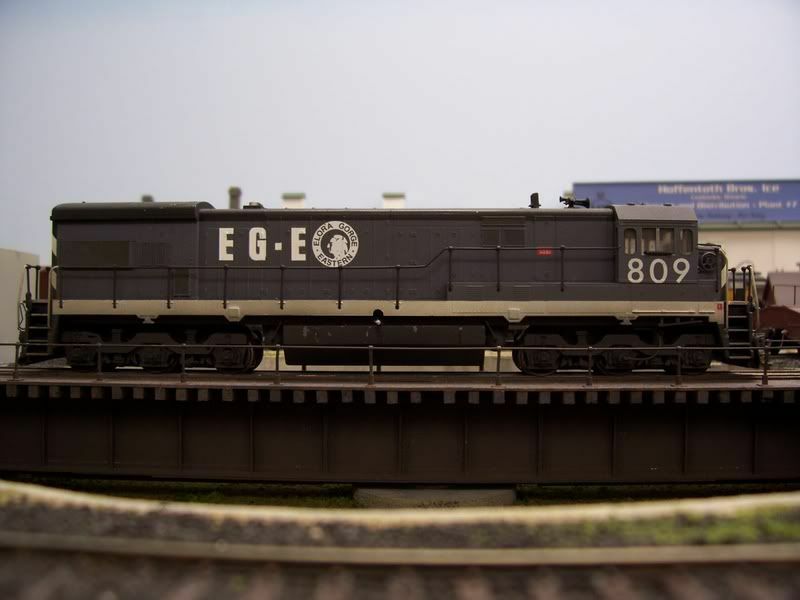 I had, at that time, intended to make it into an EG&E plow, (I owned one previously, but sold it - pretty-much "stock" - when I back-dated my layout. I needed a tender to go with the plow (the original one never had one) and since I had most of a Monogram UP Big Boy in my supply of "stuff", I thought that the tender from it would be a good one for the plow. However, it was a centipede type, and looked a bit too long for this new role, so I chopped it down to a more reasonable size. Well, some other stuff came up, and this project, too, was set aside. While looking for something else, I came across the box containing the plow kit and the butchered tender, and for some reason, it seemed to be a good idea to get back to working on it. 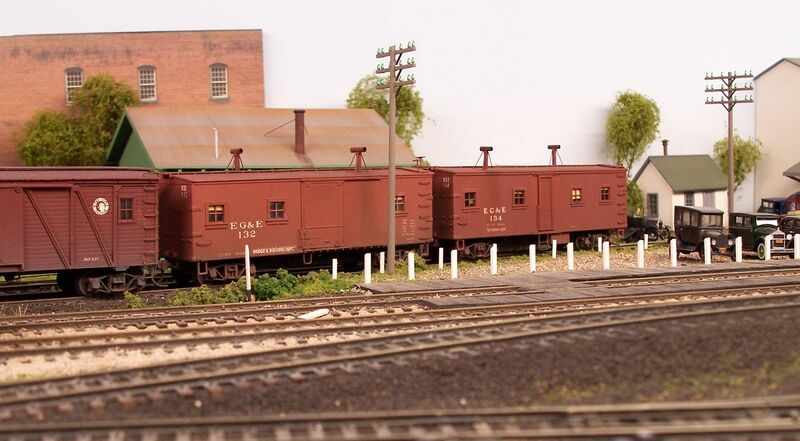 ....I'll tidy-up the cistern deck, and fabricate an oil tank to fill-in the coal bunker area. 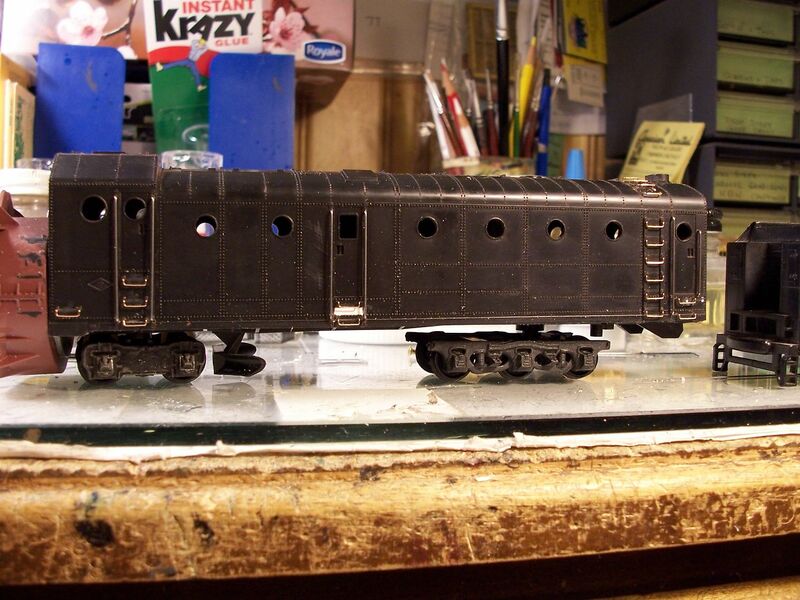 I'll also re-work the underbody to accept Athearn 6-wheel trucks, and add handrails and other details. 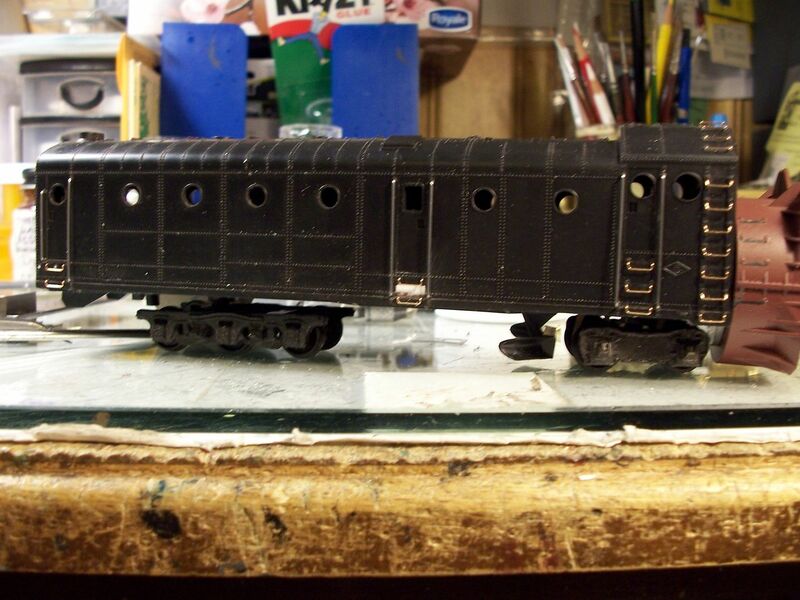 The back end looks a bit too high to me, and the underbody a bit scrawny, too, so I'll have to see what can be done. 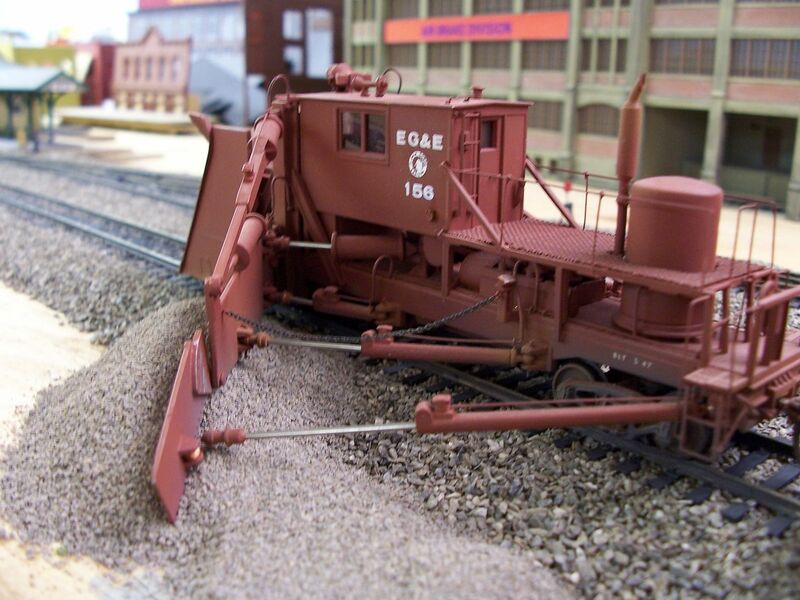 Supposedly, the Athearn plow is a fairly good representation of four snowplows, built by LIMA in 1949-50 - 1 for the Rock Island, 1 for Soo Line, and two for U.P. From the photos I've seen of the U.P. 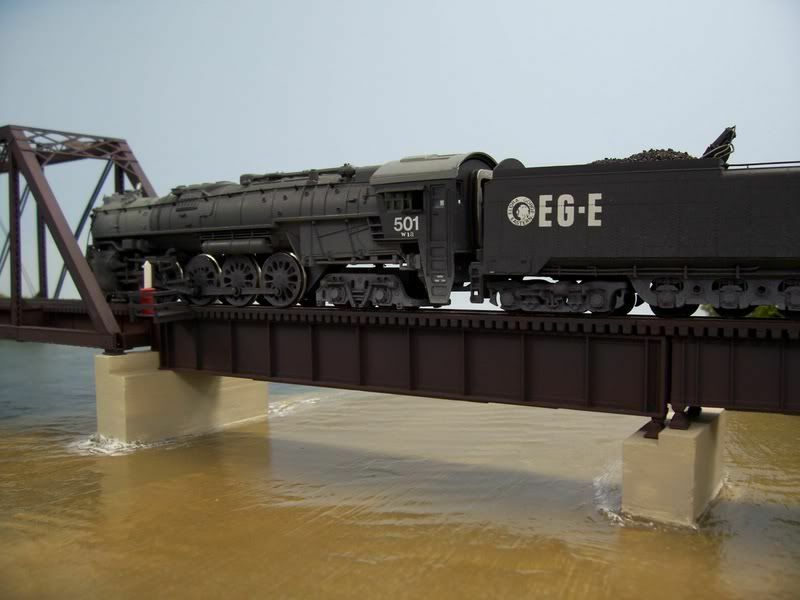 ones, they do look similar to the Athearn model, while mine will be almost identical, but built in the late '30s - the EG&E was always in the forefront of technological advances...well, that's my story of things, anyway. For now, yet to be decided. Ha! I just dug my plow out last month. 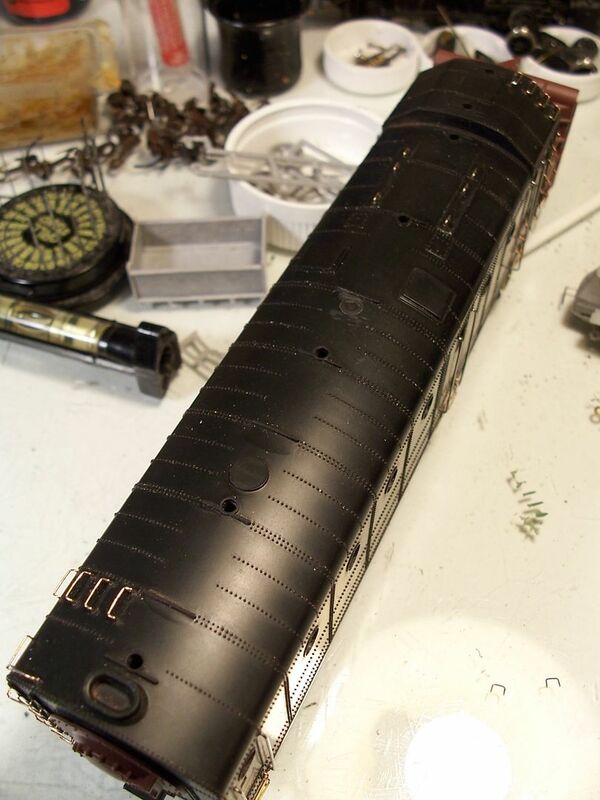 I'm trying to find new rubber bands for the Hi-F drive. As you can see in the first two photos, I've also re-located the rear truck farther back than the original, which, in my opinion, makes it look a little more well-balanced. It doesn't, however, help the scrawny look to which I referred yesterday, and I'll be adding some sort of centre sill to address that shortcoming. 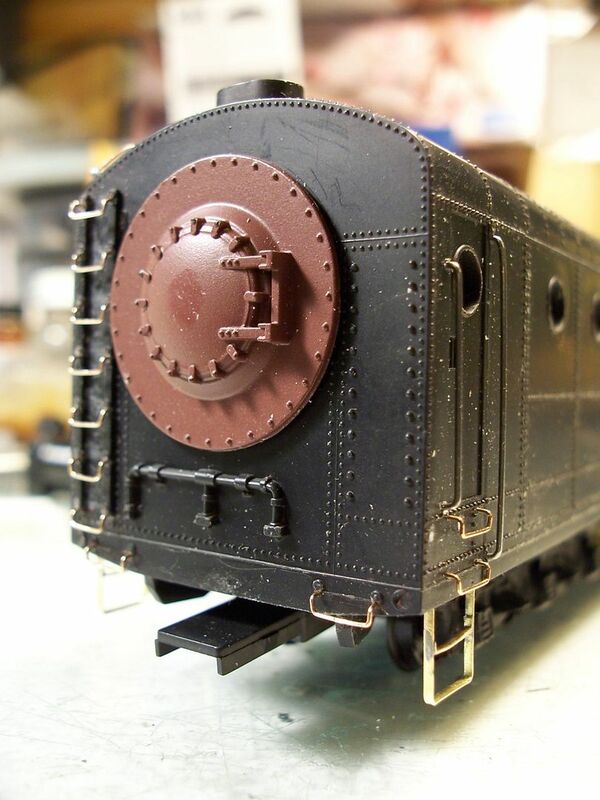 I'll also be adding some weight to the back end, as it's currently front-heavy due to the casting for the rotary cutter and its drive mechanism. 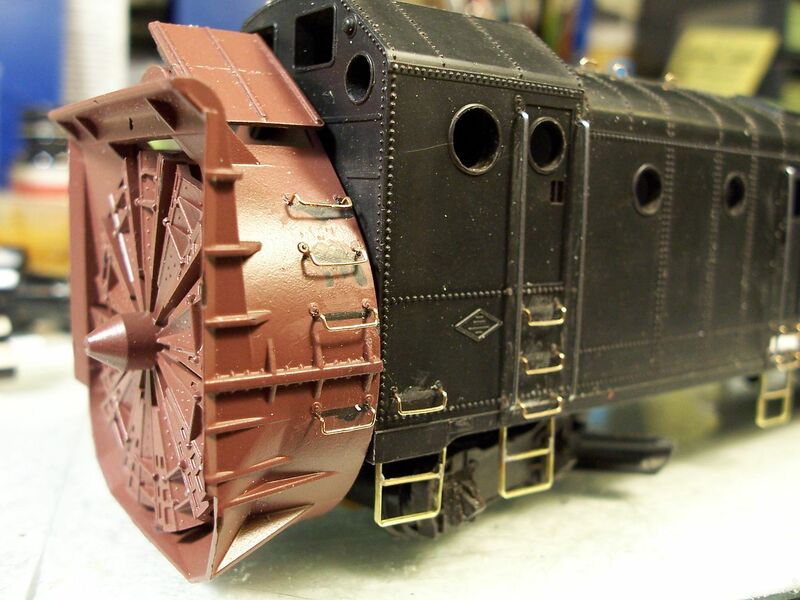 I've seen where some modellers have powered the cutting head on these plows, but unless I were planning to do snow scenes, with really deep snow, it won't be happening on this one - the rotary will be mainly scenery at various sidings around the layout. 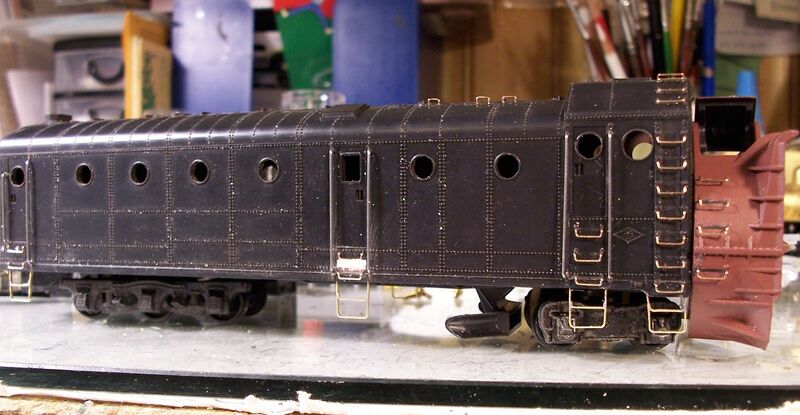 I haven't decided whether to do the rear coupler with its stock pivoting draught gear, or simply body-mount the coupler, as the relocated rear truck creates a bit of interference with the pivotted set-up. 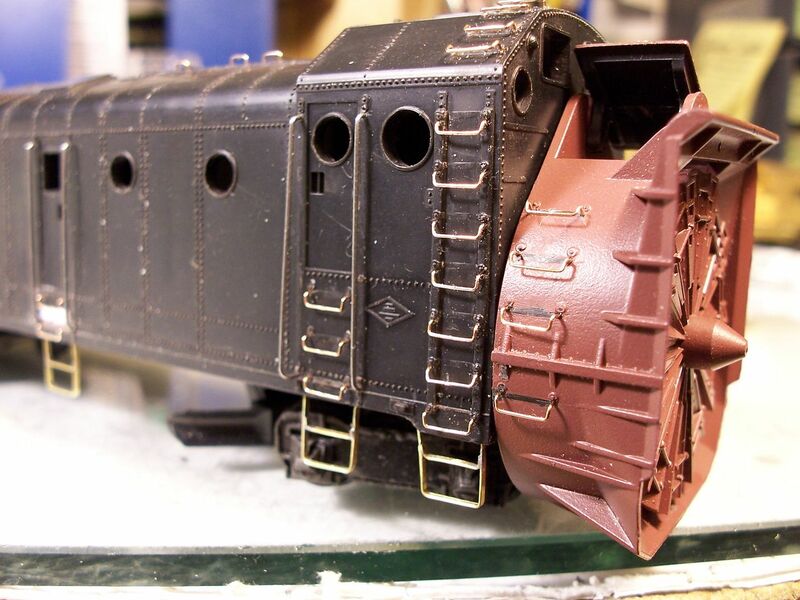 It's also possible, of course, to do a drawbar-type connection between the plow and its tender, although that might create access issues for cleaning-out the smokebox - I don't know if oil-burners needed much of that, as they don't make cinders like coal burners do. 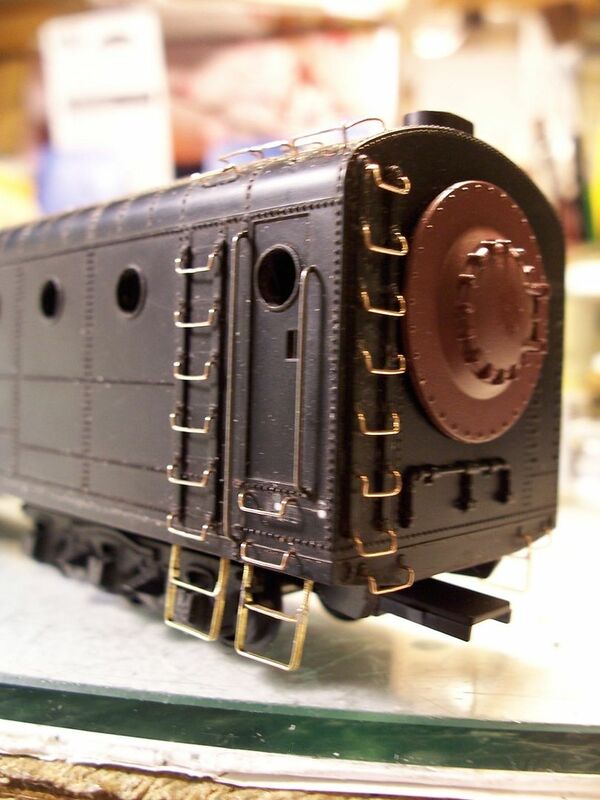 great looking project .found a photo that close to what you have done. you might have this already . Thanks Jim, I've been doing some research on rotary plows, and in addition to saving a bunch of photos, I discovered that they had air brakes (as did, of course, the tender) but I also read that the pilot (the guy in charge of the rotary) was also in charge of the rotary's fireman and engineer and the crew of the locomotive providing the pushing power, the latter through the use of whistle signals. 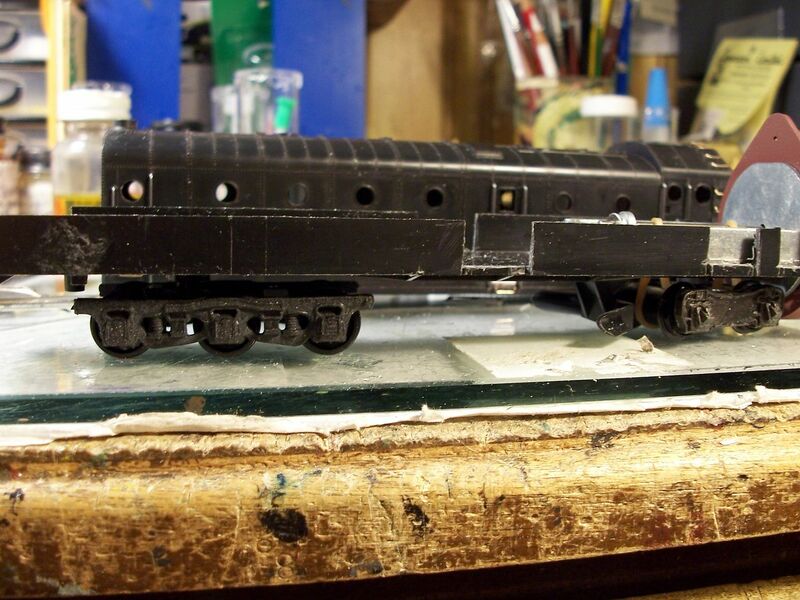 While I won't be adding LPCs (Little Plastic Crewmen), I will be adding brake equipment under both the rotary and its tender, which should give the underbodies a little more heft. 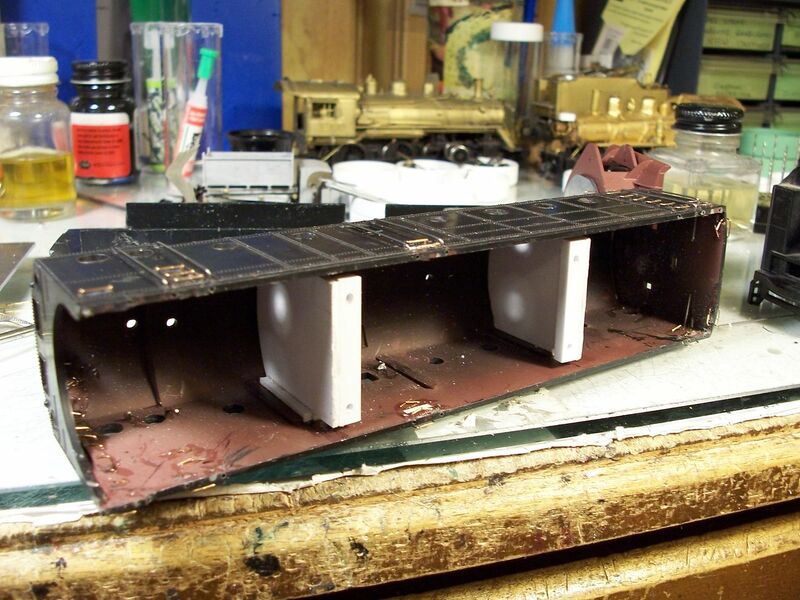 I think that I'll skip linkage to the lead truck, though, as the flanger blade will be in the way. In my version, the linkage for that will be inside the plow's body.